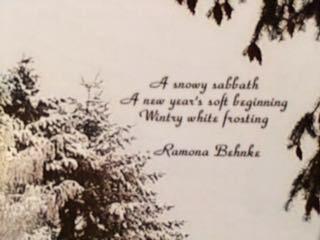 This was my poem that I posted on February 13, while we were having our snowstorms. 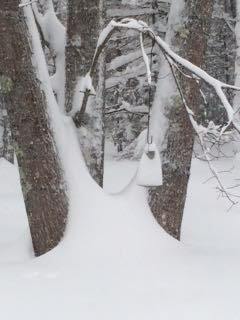 Our bird feeder was covered and filled with snow and snow was building up below while snow on the branch lowered the feeder even more. I felt bad for any birds thinking there might be some sustenance there in the storms. To stuff in your mouth. We'll be open at ten. Take out the ^+- and you have it! I don't know how effective it is to do that, but it is fun! The poem is 20 stanzas, and I have broken it up into its 20 "pieces" for sending out "peacemeal". So if you would like a piece of peace, let me know asap and I will send it out likewise! 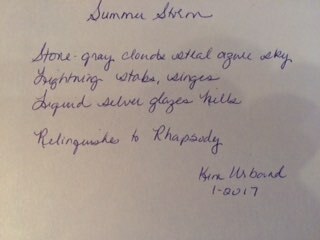 NEXT FRIDAY, March 3, I will assemble the whole poem here for Poetry Friday, and you will see where your piece fits in. 2. Ed DeCaria is once again doing the maddest madness event... "Madness! Poetry brings the excitement of the NCAA March Madness tournament to the world of kids’ poetry. 64 poets from around the world participate in the event; together, these poets write 126 new kids’ poems in just four weeks: IT’S MADNESS!" The challenge is to write a kid poem within 36 hours using an outrageous word they have been issued. They are pitted against another poet, and voting ensues! 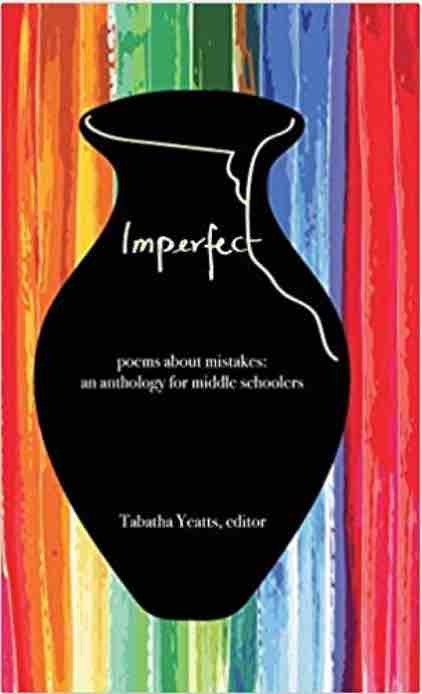 YOU get to vote, CLASSROOMS get to vote, AUTHLETES (the poets) get to vote, and a winner is named for that bout....and it goes on with other pairs of poets - um, Authletes - until there is one winner. Go to Ed's site and read all about the Madness! Poetry tournament. I am doubly excited, because I have been chosen as an Authlete to compete in this epic event! This is a month-long competition, so visit OFTEN and vote OFTEN! It starts March 4! It's Poetry Friday and time for MORE POETRY! 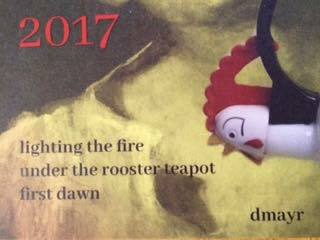 Visit the poetry offerings that our hostess, Karen at Karen Edmisten* has for us! Well, there's no going out today. 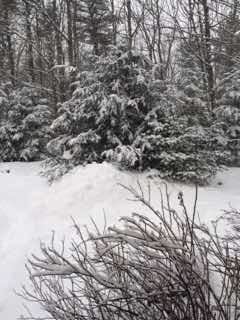 The blizzard started yesterday afternoon and has gone through the night. The winds aren't as bad yet as I thought they'd be. 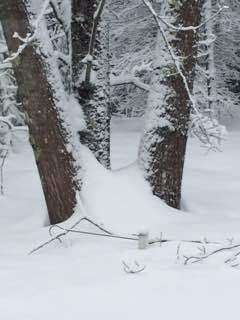 It is gusty, but snow is able to cling to branches and bird feeders still. 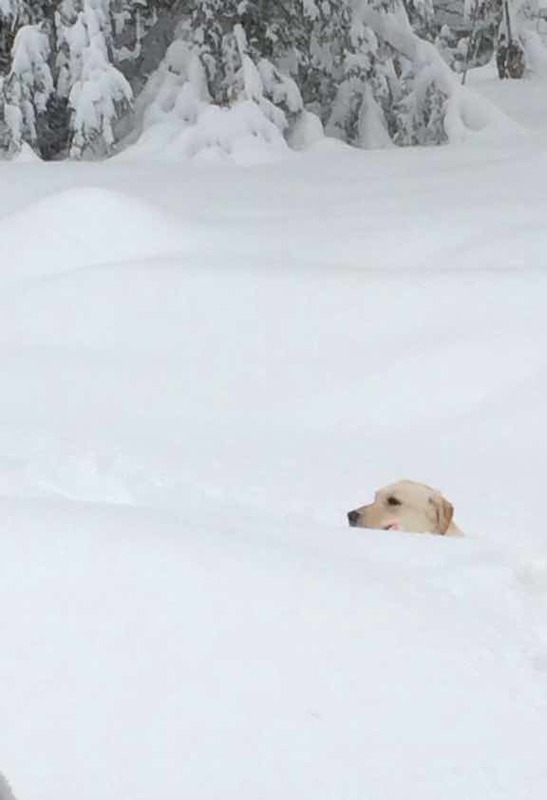 The snow is over the dog's back where it is fresh, and where it is deeper from the last storm, she has to keep her nose up pretty high! 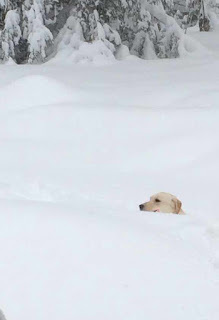 Fortunately we have a canvas Frisbee for her to fetch, but even that gets buried in the snow and is hard to find. 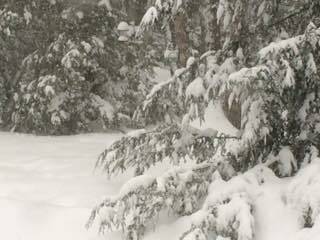 It is still snowing and will be continuing today into the afternoon sometime. Then it says the winds will pick up. It's hard to tell then whether it is snowing or not and the snow will be redistributed making drifts in spots perhaps already shoveled once or twice. It's a good day for soup and a few movies, coffee and a book, tea and a crumpet or two. I'm substituting jello for the crumpet...but I'll be doing everything else. There's a lot on my plate lately it seems, and rising very early has become the norm. Remembering to breathe deeply and regularly has become something I feel I need to prompt myself to do. Don't worry. It sounds dire. It is not. I am just not feeling the best I've ever felt in my life, but I'm not going to discuss it here. Just know that I'm not sleeping much, nor eating much. Yesterday was my first solid food in 18 days - and that was a scrambled egg and some chicken with rice soup. Yay. Jello and Italian ice are getting tiresome! I've kept up with my poetry most days, and am completing the World Peace Poetry Postcard exchange. There were 20 people on my list to send to, and I doubled+ the number of cards to go out, duplicating postcards for bloggers who would like one. If you would like a card, send me your address, and I will get one to you! I broke, twisted and adapted the suggested rules for this exchange. 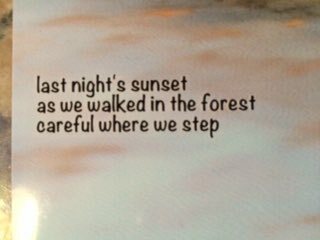 Instead of writing a poem a day, I took a couple of days and wrote a 20 stanza poem and broke it up into 20 pieces - one stanza on each card. March 3 will be a total poem reveal day on my blog. 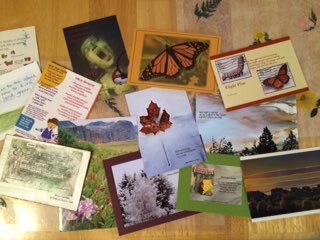 Instead of sending a card a day, I sent the World Peace Poetry exchange cards all at once, and will send the other cards out as requested. So let me know where to send one! You keep me breathing! (Not literally...don't panic!) LOL (This is literally...)! 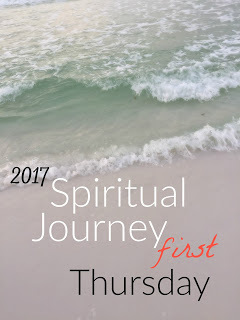 I'm excited to share! MEANWHILE - the blizzard is going to be starting around 9 am today for us and continuing through the evening on Monday. Looks like it is shaping up nicely out there. Where we are, when we get snowed in, we really get snowed in. It's a mile of unplowed road to get to the slightly plowed main road to town. These are my evenings: Ginger (the dog) lounging in a chair of her own, my husband watching tv with remote in hand, Noah (the cat) on his lap,and I in my chair beside them. Sometimes the cat is in the empty chair, sometimes on my lap. 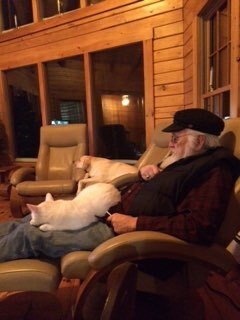 But when it is tv time, we are all together settled in, and life is good. The windows afford a snowy view in storms, give the dog entertainment when squirrels, deer or turkeys cut through. 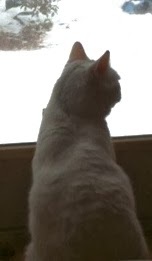 She gives warning to the cat that there is something to attend to or that she is protecting him from the UPS man or the snowplow. And sometimes they both just sit and watch. I guess this house lends itself to lots of watching. It's a comfortable house. And I will miss it when we move. Our contractor tells us it is now going to be the middle of April when our house in Friendship is done or at least livable and finishable with us in it. But I will miss this place and the memories it holds in its cedar logs, in each knot that stares at me with soulful eyes. I will miss the feeling of being in a reversed snow globe in winter storms. I will miss the privacy of a front yard where I can go outside in nightgown to stand and look at stars or take the dog out one more time. It is getting close to the time though, that I must realign my thinking to the practical, to the possibilities, to the moving ahead-ness of life. We are retired. The new house is smaller. It is WAY closer to the ocean - though we are close and on an island now, the renovated home is just across the street from the ocean and a mile to the beach. It is something I've always dreamed of. It is time to have a dream come true. Isn't it funny how you can wonder if the dream is REALLY what you want? Is the dream what you REALLY need? Are dreams ever real or meant to be real? So maybe that is not what I need to focus on. It is more the moving ahead and being practical. I am afraid though that the taxes will be too high and we will end up selling it anyway. So then where are we? Good question. Another adventure. It's Poetry Friday, so that means today is all about poetry. After your visit here, go check in on more poetry with Katie at The Logonauts. She is hosting today. 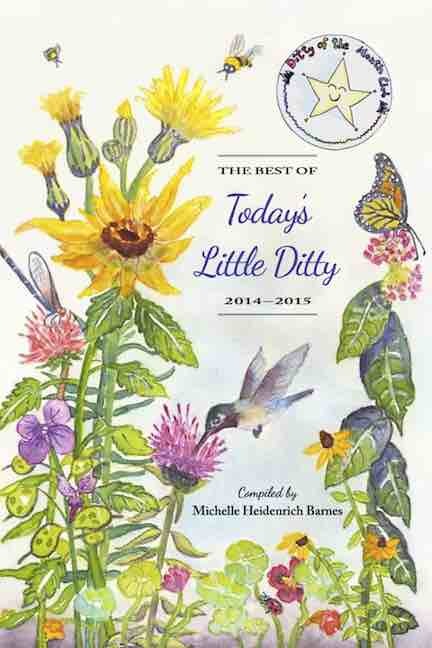 Today I want to share my poem that yesterday was published online at Silver Birch Press. On January 30, I was searching around and thought I'd check and see if Silver Birch Press had a new call for submissions. And - voila! - they did. The deadline for submitting was January 31 - the next day! I debated about 30 seconds and decided I was wasting time doing that. Fortunately, I usually see a short deadline as a motivator. So I plunged on in and wrote a couple of really awful things that day. Then at the end of the evening this one started to come together. I had it mostly finished, but needed to get my Bio, writing description and pictures together. On the deadline day, Jan. 31, I put the final edits and revisions to the poem, and sent it all off. 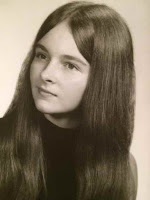 So it is here, an Etheree, "Rude Awakenings" at Silver Birch Press, a poem about ME, at 17. I'd love it if you could comment on it here or there or both, if you don't have anything better to do with your time. How was your "Year 17"? Teen years were not always easy ones back in the 1960's, but we survived - and I'm kind of happy I didn't have to do them in the 2010's. And now a happy haiku in the midst of our snowstorm. 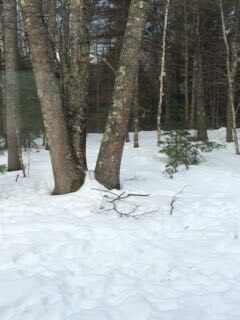 I'm watching the slowly settling flakes mount up on pine and spruce branches, and then the wild wind comes along and swirls them off in, I would say small tornadoes, but they are pretty big ones today! 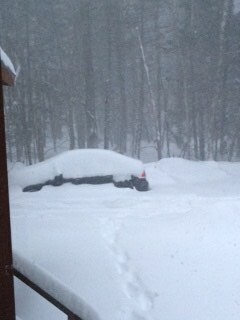 And suddenly there's a foot of fresh snow...time to shovel off the car. What a great shower of postcards this month! Thanks for organizing this exchange extravaganza, Jone! We are definitely a devoted and reliable bunch...or even over reliable because I sent out 10 and got 11 in return! 10% return on my expenditure. I'd say that was pretty good! 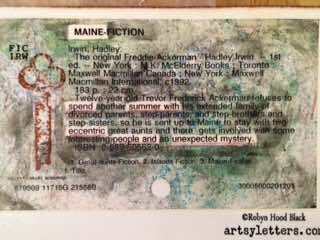 Here they are with the exception of Sylvia Vardell's, as it is a copyrighted one, and I wasn't sure if I should do a close up of the poem. What an awesome collection! I am going to have to start a postcard scrapbook I guess, so I can keep them all safe and viewable. 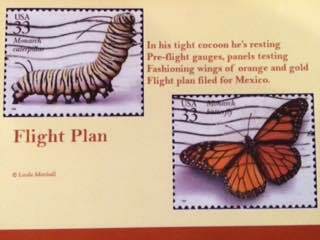 My 10 postcards went out on the 23rd to my recipients, so they should be there now at last. 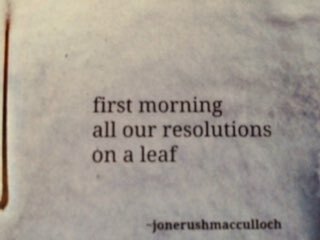 I wrote a different Haiku for each card, so that should count for a few poems a day in January! I have been writing every day, whether or not it shows up on my blog. Sometimes my poems are in comments on a blog, sometimes they just get filed for my collection. I'm finally making a collection of poems that are not yet published. 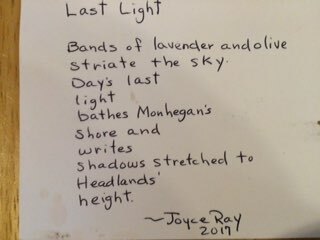 My One Little Word this year is REACH, and I am trying to reach my goal of at least 365 new and unpublished poems for the year. So far so good. 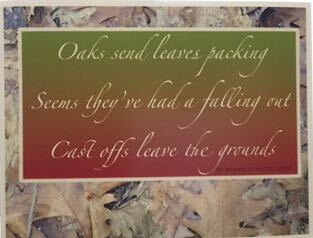 Here's a Haiku from a postcard I sent this month...let's count it as my poem for today! Happy Poetry Friday! 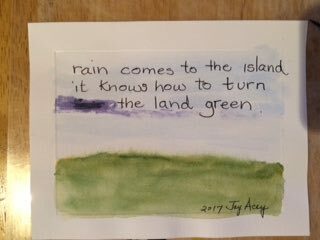 Time to go read more poetry by clicking on links at Penny Parker Klosterman's place, A Penny and Her Jots. 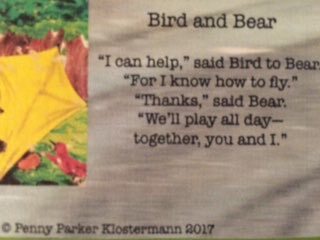 Reach out to someone today - make it a nice day! 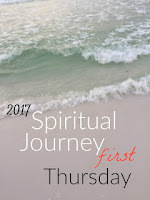 This first Thursday in February is centered on the word RISE, offered by Leigh Anne, who is hosting today's Spiritual Journey First Thursday. Go to her blog His Turn to read more posts on RISE. I kept bringing the word Rise up in my thoughts this week. It would literally - though really figuratively, I guess - rise up and take over my thinking. It didn't rise well, though. So many thoughts went through my head. Then I saw this video. I was looking for a song I'd heard with Rise in it. This wasn't it. It was so inspirational though. I'd never heard it before. The video is especially moving, and makes me want to be a better person - to rise above what tries to hold me down - to rise and shine. RISE and SHINE for someone today!